Due to high levels of harassment, intimidation and conflict deaths in Myanmar (also called Burma) that is openly carried out by hostile Buddhists and (purportedly) by Burmese government troops, some 400,000 Rohingya muslims have fled in recent days to neighbouring Bangladesh. The refugees are arriving tired, afraid, hungry and disoriented as they flee their burning villages. Sixty per cent of those fleeing, are women and children. It’s not that Burma hasn’t any Muslims. On the contrary, 4.3 per cent of the country are Muslim (about 2.6 million in total) while 88 per cent (46 million) are Buddhist and 6 per cent are Christian. What’s different for the Muslims in Burma is that due to arcane Burmese law, they aren’t allowed to own real estate (land or buildings) because they aren’t recognized as citizens due to the fact they can’t prove their ancestors lived there prior to 1823. The Rohingya are… human beings without a country. In recent years over 100,000 have fled to nearby countries to work or to ask for refugee status. Most of them didn’t qualify for Burmese citizenship in the first place — and therefore arrived in a totally new country with no birth certificate, passport, other reliable identification, or even a family address. Intolerable, doesn’t begin to describe it. Which is why hundreds of thousands of Rohingyas have landed across the border in Bangladesh since August 25th. 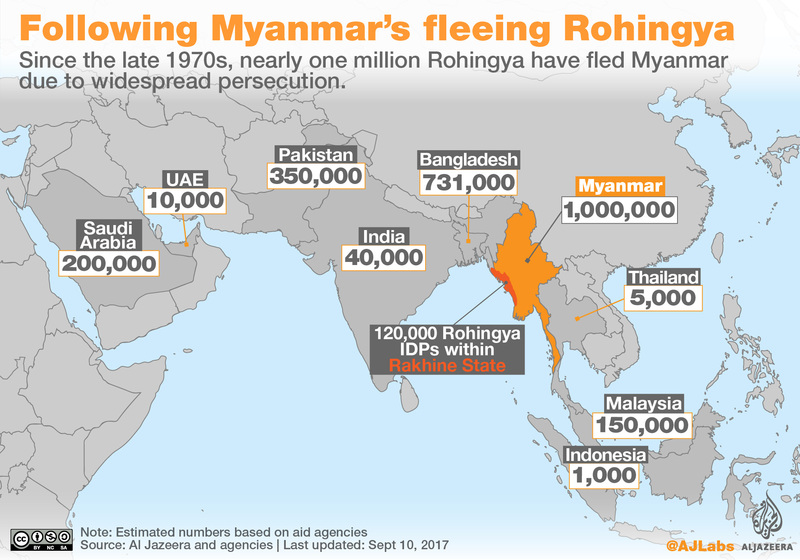 Up to 2.3 million more may arrive in the coming months if all Burmese muslims flee the country. If the present situation is any indication, it looks like all of them will leave Burma. Why Not Just Go Back? Burmese Rohingyas have nothing to return to, only burned out villages and increasingly hostile citizens. And once having crossed over into Bangladesh, they can’t cross back into the country in which they were born because they have no legal identification to show to Burmese border guards other than a long-distance telephone calling card (if they’re lucky) and no family address that is recognized by the Burmese authorities. For decades, the Rohingya have been leaving Burma for Bangladesh and other southeast Asian nations, seeking employment and a chance at a new life. In those places, if they can find employment they can eventually apply for citizenship and become an actual citizen, with an actual street address, and be a person with an actual job and a real life. If you’re a factory owner that hires a Rohingya, you know they are highly motivated to succeed and that they will be the least problematic of all your workers. However, even a successful economy like Bangladesh can’t accept millions of refugees in a matter of weeks. The country is doing relatively well for a developing nation and continues to improve its infrastructure and the lives of its citizens every year. Bangladesh is ranked surprisingly highly by development agencies, and is often referred to ‘one of the next-11’ countries after the G20 countries. What Will it Take to Help the Rohingya? 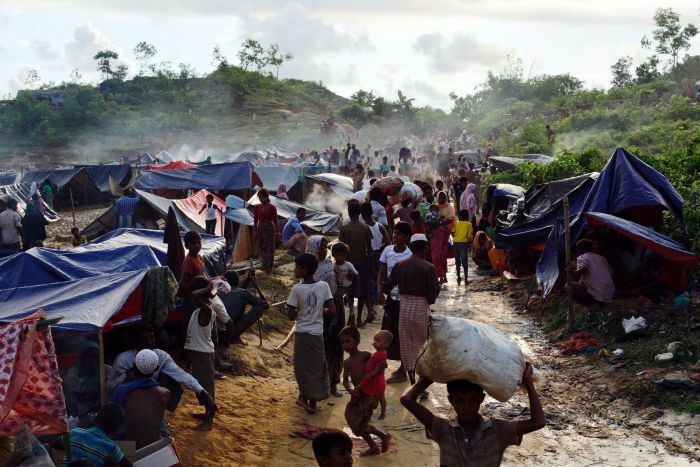 In the southern region of Bangladesh, 409,000 Rohingya are being held in camps stretching along the border with Burma. While 60 per cent of the refugees are women and children, Bangladeshis worry about young Rohingya males who may have been exposed to extremist thought and could conceivably at least, act against Bangladesh citizens in the future. So far, nothing like that has been reported. However, keeping hundreds of thousands of refugees in miserable and makeshift camps in hot and humid weather isn’t going to help anyone’s mood. Even if the Rohingyas arrived there never having imagined a terrorist thought in their life, a year of living under those conditions won’t help to keep violent acts out of the minds of young men, who, like young men everywhere, are prone to acting on a perceived problem without properly thinking it through. If Prime Minister of Bangladesh, Sheikh Hasina can convince UN donors to generously fund the effort, her country has a very good chance of accommodating the sudden flood of refugees; Assisting them to find jobs, homes, and helping to build the strong sort of communities that are an asset to any country — but if it doesn’t happen in this manner, that region of Bangladesh is on the same path as the extremely hurtful (to all sides) Israeli/Palestinian conflict was at its very beginning. Nobody wants that. Or do they? We’ll see what the response is when the UN General Assembly meets this week in New York. What Jobs Can the Rohingya Do? If Bangladesh elects to help the Rohingya fleeing persecution in Burma, the best way forward is to employ them as farm labourers in the southern part of the country. Many of these people have lived in rustic conditions and it will take some time before they will be getting jobs as CEO’s, airline pilots, or automobile designers. But that’s not to say they can’t make a valuable contribution to the Bangladesh economy — they can! Starting the Rohningyas working in the fields will allow them to acclimatize to the new country and cement their place as valuable workers in Bangla society. The most important thing for the Bangladeshi authorities to remember after taking care of food, shelter and medicine for the new refugees is to provide a sense of community. Just dumping these people on a hunk of land and feeding them every day isn’t going to solve anything other than saving their lives, but the eventual result will be a social crisis on the scale of what we’re witnessing in the Philippines today. What Kind of Housing for Working Rohingya Families? Refugees that want to work should have access to temporary living quarters. You simply can’t get any sleep in a refugee camp (you know this if you’ve ever visited one!) and therefore, you won’t keep your job very long. Therefore, it’s important to relocate Rohingya workers to suitable accommodations for workers and their families until they can save up enough to purchase their own dwelling. There are thousands of used portable offices and portable crew quarters in the world available at any time. Not only that, but the UN could purchase thousands of new ATCO-type portable trailers to house Rohingya workers and ship them to southern Bangladesh. In that way, those Rohingyas that are able and willing to work, will have appropriate accommodation. The benefit of these portable buildings is that they are prewired for electricity, and stoves and heat are provided by natural gas tanks located on the exterior of the unit. One point to remember about this kind of living quarters is that they can be lifted via crane and placed on top of solid stilts — this is important in Bangladesh as many areas of the country are prone to flooding during the annual monsoon season. Many Bangla homes are placed on stilts to avoid being flooded or carried away in the floodwaters. Portable ATCO trailers could house Rohingya farm workers in Bangladesh. ATCO Ltd. It seems Shaikh Hasina, Prime Minister of Bangladesh sincerely wants to assist the Rohingya refugees and that’s admirable. However, it’s going to take a few billion dollars just to meet the needs of these desperate people until the end of the year. After that, rather than allowing the miserable conditions of the refugee camps to become the fuel for conflict, the Rohingya must be proactively urged to find local work on the many farms in the region. It’s really the only option in this case. Getting refugees employed is almost as important as sheltering and feeding them as they stream across the Bangladesh border. 1. We, the Leaders of the Federative Republic of Brazil, the Russian Federation, the Republic of India, the People’s Republic of China and the Republic of South Africa, met on 4 September 2017 in Xiamen, China, at the Ninth BRICS Summit under the theme BRICS: Stronger Partnership for a Brighter Future we endeavor to build on our achievements already made with a shared vision for future development of BRICS. We also discussed international and regional issues of common concern and adopted the Xiamen Declaration by consensus. 2. We reiterate that it is the overarching objective and our desire for peace, security, development and cooperation that brought us together 10 years ago. BRICS countries have since traversed a remarkable journey together on their respective development paths tailored to their national circumstances, devoted to growing their economies and improving people’s livelihoods. Our committed and concerted efforts have generated a momentum of all-dimensional and multi-layered cooperation fostered by the previous Leaders’ Summits. Upholding development and multilateralism, we are working together for a more just, equitable, fair, democratic and representative international political and economic order. 3. Our cooperation since 2006 has fostered the BRICS spirit featuring mutual respect and understanding, equality, solidarity, openness, inclusiveness and mutually beneficial cooperation, which is our valuable asset and an inexhaustible source of strength for BRICS cooperation. We have shown respect for the development paths of our respective choices, and rendered understanding and support to each other’s interests. We have upheld equality and solidarity. We have also embraced openness and inclusiveness, dedicated to forging an open world economy. We have furthered our cooperation with emerging markets and developing countries (EMDCs). We have worked together for mutually beneficial outcomes and common development, constantly deepening BRICS practical cooperation which benefits the world at large. 5. Recalling our Summits in Ufa and Goa, we will work together to further enhance BRICS strategic partnership for the welfare of our peoples. We commit ourselves to build upon the outcomes and consensus of our previous Summits with unwavering conviction, so as to usher in the second golden decade of BRICS cooperation and solidarity. 6. Believing in the broad development prospects of our countries and the vast potential of our cooperation, we have full confidence in the future of BRICS. We commit to further strengthen our cooperation. — We will energize our practical cooperation to boost development of BRICS countries. We will, inter alia, promote exchanges of good practices and experiences on development, and facilitate market inter-linkages as well as infrastructure and financial integration to achieve interconnected development. We shall also strive towards broad partnerships with EMDCs, and in this context, we will pursue equal-footed and flexible practices and initiatives for dialogue and cooperation with non-BRICS countries, including through BRICS Plus cooperation. — We will enhance communication and coordination in improving global economic governance to foster a more just and equitable international economic order. We will work towards enhancement of the voice and representation of BRICS countries and EMDCs in global economic governance and promote an open, inclusive and balanced economic globalization, thus contributing towards development of EMDCs and providing strong impetus to redressing North-South development imbalances and promoting global growth. — We will emphasize fairness and justice to safeguard international and regional peace and stability. We will stand firm in upholding a fair and equitable international order based on the central role of the United Nations, the purposes and principles enshrined in the Charter of the United Nations and respect for international law, promoting democracy and the rule of law in international relations, and making joint efforts to address common traditional and non-traditional security challenges, so as to build a brighter shared future for the global community. — We will embrace cultural diversity and promote people-to-people exchanges to garner more popular support for BRICS cooperation through deepened traditional friendships. We will expand people-to-people exchanges in all dimensions, encourage all fabrics of the society to participate in BRICS cooperation, promote mutual learning between our cultures and civilizations, enhance communication and mutual understanding among our peoples and deepen traditional friendships, thus making BRICS partnership closer to our people’s hearts. 7. We note that against the backdrop of more solid global economic growth, enhanced resilience and emerging new drivers, BRICS countries continue to play an important role as engines of global growth. Noting the uncertainties and downside risks that persist, we emphasize the need to be vigilant in guarding against inward-looking policies and tendencies that are weighing on global growth prospects and market confidence. We call upon all countries to calibrate and communicate their macroeconomic and structural policies and strengthen policy coordination. 8. We note that practical economic cooperation has traditionally served as a foundation of BRICS cooperation, notably through implementing the Strategy for BRICS Economic Partnership and initiatives related to its priority areas such as trade and investment, manufacturing and minerals processing, infrastructure connectivity, financial integration, science, technology and innovation, and Information and Communication Technology (ICT) cooperation, among others. We welcome the first report on the implementation of the Strategy for BRICS Economic Partnership, and the broad package of outcomes delivered by the sectoral ministerial meetings. We commit to use all policy tools – fiscal, monetary and structural – and adopt innovation-driven development strategies to enhance resilience and potentials of our economies, so as to contribute to strong, sustainable, balanced and inclusive global growth. 9. Stressing the role of enhanced trade and investment cooperation in unleashing the potential of BRICS economies, we agree to improve and broaden trade and investment cooperation mechanism and scope, with a view to enhancing BRICS economic complementarity and diversification in BRICS countries. We welcome the positive outcomes of the 7th BRICS Trade Ministers Meeting in terms of the cooperative frameworks, roadmaps and outlines on trade and investment facilitation and connectivity and enhanced policy sharing, information exchange, capacity building, through enhanced joint efforts on trade and investment facilitation, trade in services, E-commerce, IPR (in synergy with the cooperation activities among BRICS IP authorities), economic and technical cooperation, SMEs and women economic empowerment. We welcome the setting up of the BRICS E-Port Network that will operate on a voluntary basis and the establishment of the BRICS E-commerce Working Group. We also welcome China’s initiative to host an International Import Expo in 2018 and encourage our business communities to actively participate in it. 10. We stress the importance of enhancing BRICS financial cooperation to better serve the real economy and meet the development needs of BRICS countries. We note the agreement by the finance ministers and central bank governors on cooperation on Public Private Partnerships (PPP), including through PPP experience exchange and application of the BRICS Good Practices on PPP Frameworks. We acknowledge the establishment of a temporary task force to conduct technical discussion on various ways of cooperation, including utilizing existing facilities of the MDBs based on national experiences, exploring the possibility of establishing a new PPP Project Preparation Fund and other options. We encourage cooperation and coordination by our accounting standards setters and audit regulators and agree to explore convergence of accounting standards and continue discussion on cooperation on auditing oversight in the area of bond issuance, so as to lay the groundwork for bond market connectivity among BRICS countries, with due regard to applicable national legislation and policies. We agree to promote the development of BRICS Local Currency Bond Markets and jointly establish a BRICS Local Currency Bond Fund, as a means of contribution to the capital sustainability of financing in BRICS countries, boosting the development of BRICS domestic and regional bond markets, including by increasing foreign private sector participation, and enhancing financial resilience of BRICS countries. 11. In order to serve the demand arising from rapid growth of trade and investment among the BRICS countries, we agree to facilitate financial market integration through promoting the network of financial institutions and the coverage of financial services within BRICS countries, subject to each country’s existing regulatory framework and WTO obligations, and to ensure greater communication and cooperation between financial sector regulators. We agree to take an active part in the efforts to implement and improve International Standards on Combating Money Laundering and the Financing of Terrorism and Proliferation in FATF, including through cooperation among BRICS Heads of Delegation on AML/CFT, also in the context of the work of BRICS CTWG and by using other platforms and to safeguard integrity of national financial systems. We agree to communicate closely to enhance currency cooperation, consistent with each central bank’s legal mandate, including through currency swap, local currency settlement, and local currency direct investment, where appropriate, and to explore more modalities of currency cooperation. We encourage the BRICS Interbank Cooperation Mechanism to continue playing an important role in supporting BRICS economic and trade cooperation. We commend the progress in concluding the Memoranda of Understanding among national development banks of BRICS countries on interbank local currency credit line and on interbank cooperation in relation to credit rating. 12. We highlight the importance of innovation as a key driver for mid and long term economic growth and global sustainable development. We commit to promote cooperation on science, technology and innovation (STI) to forge synergy in tapping new growth momentum for our five economies and continue to address the development challenges we face. We commend the selection of BRICS research and development projects under the BRICS STI Framework Program and note the launch of the 2nd call for projects. We welcome the BRICS STI Cooperation MOU and support enhanced cooperation on innovation and entrepreneurship, including by promoting technology transfer and application, cooperation among science and technology parks and enterprises as well as mobility of researchers, entrepreneurs, professionals and students. We encourage increased participation of the academia, businesses, civil society and other stakeholders in this process, and support the promotion of STI investment and cross-border investment through existing funding, institutions and platforms including the NDB. We agree to continue to work on a cooperation platform for innovation and entrepreneurship and support the implementation of the BRICS Innovation Cooperation Action Plan 2017-2020. 13. We reaffirm our commitment to BRICS industrial cooperation, including on industrial capacities and policies, new industrial infrastructure and standards, and among small, micro and medium-sized enterprises (SMMEs), so as to jointly seize the opportunities brought about by the new industrial revolution and expedite our respective industrialization processes. We encourage exploring the establishment of BRICS Institute of Future networks. We will enhance joint BRICS research, development and innovation in ICT including the Internet of Things, Cloud computing, Big Data, Data Analytics, Nanotechnology, Artificial Intelligence and 5G and their innovative applications to elevate the level of ICT infrastructure and connectivity in our countries. We will advocate the establishment of internationally applicable rules for security of ICT infrastructure, data protection and the Internet that can be widely accepted by all parties concerned, and jointly build a network that is safe and secure. We will increase investment of ICT, recognize the need to further increase investment in ICT Research and development, unleash the dynamics of innovation in producing goods and services. We encourage identification and facilitation of partnership between institutes, organizations, enterprises in the implementation of proof of concepts and pilot projects by leveraging complementary strengths in ICT hardware, software and skills through developing next generation of innovative solutions in the areas of smart cities, health care and energy efficient device, etc. We support active collaboration in implementing the BRICS ICT Development Agenda and Action Plan. 14. We reaffirm our commitment to fully implementing the 2030 Agenda for Sustainable Development. We will also advocate equitable, open, all-round, innovation-driven and inclusive development, to achieve sustainable development in its three dimensions – economic, social and environmental- in a balanced and integrated manner. We support the important role of the United Nations, including the High Level Political Forum on Sustainable Development (HLPF), in coordinating and reviewing global implementation of the 2030 Agenda, and support the need to reform the UN Development System with a view to enhancing its capability in supporting Member States in implementing the 2030 Agenda. We urge developed countries to honor their Official Development Assistance commitments in time and in full and provide more development resources to developing countries. 15. Underlining the strategic importance of energy to economic development, we commit to strengthen BRICS cooperation on energy. We recognize that sustainable development, energy access, and energy security are critical to the shared prosperity and future of the planet. We acknowledge that clean and renewable energy needs to be affordable to all. We will work to foster open, flexible and transparent markets for energy commodities and technologies. We will work together to promote most effective use of fossil fuels and wider use of gas, hydro and nuclear power, which will contribute to the transformation toward a low emissions economy, better energy access, and sustainable development. In this regard, we underline the importance of predictability in accessing technology and finance for expansion of civil nuclear energy capacity which would contribute to sustainable development in BRICS countries. We encourage continued dialogue on the establishment of a BRICS Energy Research Cooperation Platform and urge relevant entities to continue to promote joint research on energy cooperation and energy efficiency. 16. We commit to further promote green development and low-carbon economy, in the context of sustainable development and poverty eradication, enhance BRICS cooperation on climate change and expand green financing. We call upon all countries to fully implement the Paris Agreement adopted under the principles of the United Nations Framework Convention on Climate Change (UNFCCC) including the principles of common but differentiated responsibilities and respective capabilities, and urge developed countries to provide financial, technological and capacity-building support to developing countries to enhance their capability in mitigation and adaptation. 17. Stressing the importance of environmental cooperation to sustainable development of our countries and the well-being of our peoples, we agree to take concrete actions to advance result-oriented cooperation in such areas as prevention of air and water pollution, waste management and biodiversity conservation. We recognize the importance of an environmentally sound technology platform and of improving urban environmental sustainability, and support BRICS joint efforts in this regard. Brazil, Russia, India and South Africa appreciate and support China’s hosting of the meeting of the Conference of the Parties to the Convention on Biological Diversity in 2020. 18. Noting the fruitful agricultural cooperation over the past years, we recognize the unique characteristics and complementarity of BRICS countries in agricultural development and vast cooperation potential in this area. In this connection, we agree to deepen cooperation in the five priority areas such as food security and nutrition, adaptation of agriculture to climate change, agricultural technology cooperation and innovation, agricultural trade and investment, and ICT application in agriculture to contribute to stable global agricultural growth and achievement of Sustainable Development Goals. We welcome the establishment in India of the Coordination Center of BRICS Agriculture Research Platform, a virtual network which will facilitate addressing these priority areas. 19. We express concern over the challenges faced by the African continent in achieving independent and sustainable development and in wildlife conservation. We reaffirm our commitment to strengthen cooperation with Africa and help the continent to address illegal wildlife trade, promote employment, food security, infrastructure development and industrialization including through connectivity and developmental initiatives and projects. We reaffirm our strong support for African Union’s implementation of its various programs under Agenda 2063 in pursuit of its continental agenda for peace and socio-economic development. 20. Keenly aware of the negative impact of corruption on sustainable development, we support the efforts to enhance BRICS anti-corruption cooperation. We reaffirm our commitment to intensify dialogue and experience sharing and support compiling a compendium on fighting corruption in BRICS countries. We further acknowledge that illegal flow of the proceeds of corruption impairs economic development and financial stability, and support enhanced cooperation in asset recovery. We support the strengthening of international cooperation against corruption, including through the BRICS Anti-Corruption Working Group, as well as on matters related to asset recovery and persons sought for corruption. We acknowledge that corruption including illicit money and financial flows, and ill-gotten wealth stashed in foreign jurisdictions is a global challenge which may impact negatively on economic growth and sustainable development. We will strive to coordinate our approach in this regard and encourage a stronger global commitment to prevent and combat corruption on the basis of the United Nations Convention against Corruption and other relevant international legal instruments. 21. Living in the era of digital economy, we are ready to use opportunities it provides and address challenges it poses for the global growth. We will act on the basis of principles of innovation, partnership, synergy, flexibility, open and favorable business environment, trust and security, protection of consumer rights in order to ensure the conditions for a thriving and dynamic digital economy, that will foster global economic development and benefit everyone. 22. We appreciate the efforts and contribution of the BRICS Business Council and Business Forum to strengthening our economic cooperation in infrastructure, manufacturing, energy, agriculture, financial services, e-commerce, alignment of technical standards and skills development. We welcome the establishment of a working group on regional aviation within the framework of the Business Council and in this connection acknowledge the Brazil’s proposal on an MOU on regional aviation partnership. We encourage business communities and associations to actively participate in BRICS cooperation, and give full play to their role as trade and investment facilitation institutions in promoting mutually beneficial cooperation. 23. We recognize the importance of transformation that is taking place in the labor market and the opportunities and challenges it brings. We note with satisfaction the progress in BRICS cooperation with regard to human resources, employment and social security, fostering strong labor market information systems and networking of BRICS of Labor Research Institutes and BRICS Social Security Cooperation Framework. We welcome the achievement of a BRICS common position on governance in the future of work and agree to further strengthen exchanges and cooperation in ensuring full employment, promoting decent work, advancing poverty alleviation and reduction through skills development and achieving universal and sustainable social security systems. 24. We recognize the importance of competition protection to ensure the efficient social and economic development of our countries, to stimulate innovative processes and to provide quality products to our consumers. We note the significance of the interaction between the Competition Authorities of our countries, in particular, in identifying and suppressing restrictive business practices that are of a transboundary nature. 25. We note with satisfaction the progress made by Customs Administrations in their cooperation on trade facilitation, security and enforcement, capacity building and other issues of mutual interest, including through such mechanisms as BRICS Customs Cooperation Committee and BRICS Customs Working Group. We encourage broadened cooperation under the guiding principles of mutual sharing of information, mutual recognition of customs control, and mutual assistance in enforcement so as to boost growth and promote people’s welfare. In order to strengthen mutual cooperation in customs matters, we reaffirm our commitment to finalize BRICS Customs Mutual Assistance Agreement at the earliest. 26. We adhere to the principle of utilizing outer space for peaceful purposes and emphasize the need to strengthen the international cooperation in space activities in order to use space technologies to respond to global climate change, environmental protection, disaster prevention and relief and other challenges faced by humankind. 27. Recalling the Saint-Petersburg and Udaipur Declarations of BRICS Ministers for Disaster Management and the decision to establish a BRICS Joint Taskforce on Disaster Risk Management, we underline the importance of consistent joint work of emergency services of BRICS countries aimed at building a safer future by reducing existing disaster risks, including exchange of information on best practices concerning disaster risk management and cooperation in the field of forecasting and early warning for effective response to natural and human induced disasters. 28. We note with satisfaction the progress in BRICS cooperation in such fields as audit, statistics and export credit and agree to further advance cooperation in these fields. 29. We resolve to foster a global economic governance architecture that is more effective and reflective of current global economic landscape, increasing the voice and representation of emerging markets and developing economies. We reaffirm our commitment to conclude the IMF’s 15th General Review of Quotas, including a new quota formula, by the 2019 Spring Meetings and no later than the 2019 Annual Meetings. We will continue to promote the implementation of the World Bank Group Shareholding Review. 30. We emphasize the importance of an open and resilient financial system to sustainable growth and development, and agree to better leverage the benefits of capital flows and manage the risks stemming from excessive cross-border capital flows and fluctuation. The BRICS CRA represents a milestone of BRICS financial cooperation and development, which also contributes to global financial stability. We welcome the establishment of the CRA System of Exchange in Macroeconomic Information (SEMI), and the agreement to further strengthen the research capability of the CRA, and to promote closer cooperation between the IMF and the CRA. 31. We welcome the establishment of the NDB Africa Regional Center launched in South Africa, which is the first regional office of the Bank. We welcome the setting up of the Project Preparation Fund and the approval of the 2nd batch of projects. We congratulate the Bank on the ground-breaking of its permanent headquarters building. We stress the significance of infrastructure connectivity to foster closer economic ties and partnerships among countries. We encourage the NDB to fully leverage its role and enhance cooperation with multilateral development institutions including the World Bank and the Asian Infrastructure Investment Bank as well as with the BRICS Business Council, to forge synergy in mobilizing resources and promote infrastructure construction and sustainable development of BRICS countries. 32. We emphasize the importance of an open and inclusive world economy enabling all countries and peoples to share in the benefits of globalization. We remain firmly committed to a rules-based, transparent, non-discriminatory, open and inclusive multilateral trading system as embodied in the WTO. We reaffirm our commitments to ensure full implementation and enforcement of existing WTO rules and are determined to work together to further strengthen the WTO. We call for the acceleration of the implementation of the Bali and Nairobi MCM outcomes and for the WTO ministerial conference to be held this year in Argentina to produce positive outcomes. We will continue to firmly oppose protectionism. We recommit to our existing pledge for both standstill and rollback of protectionist measures and we call upon other countries to join us in that commitment. 33. Valuing the G20’s continued role as the premier forum for international economic cooperation, we reiterate our commitments to the implementation of the outcomes of G20 summits, including the Hamburg Summit and the Hangzhou Summit. We call upon the G20 to further enhance macroeconomic policy coordination to minimize negative spillovers and external shocks to EMDEs. We agree to enhance coordination and cooperation under the Argentina Presidency in 2018, with an aim to make the G20 process and outcomes reflect the interests and priorities of EMDEs. 34. We reaffirm our commitment to achieving a fair and modern global tax system and promoting a more equitable, pro-growth and efficient international tax environment, including to deepening cooperation on addressing Base Erosion and Profit Shifting (BEPS), promoting exchange of tax information and improving capacity-building in developing countries. We will strengthen BRICS tax cooperation to increase BRICS contribution to setting international tax rules and provide, according to each country’s priorities, effective and sustainable technical assistance to other developing countries. 35. Cognizant of the profound changes the world is undergoing and the global security challenges and threats faced by the international community, we commit to enhance communication and cooperation in international fora on issues concerning international peace and security. We reiterate our commitment to safeguarding world peace and security and to upholding the basic norms of the international law, and the purposes and principles of the Charter of the United Nations including sovereign equality and non-interference in other countries’ internal affairs. 37. We welcome China’s hosting of the Meeting of BRICS Ministers of Foreign Affairs/International Relations in Beijing on 18-19 June 2017 at the initiative of China. Ministers exchanged views on major global political, security, economic and financial issues of common concern and on strengthening BRICS cooperation. We look forward to the upcoming meeting of Foreign Ministers on the margins of the UNGA. We welcome South Africa’s offer to host the next stand-alone Foreign Ministers Meeting in 2018. 38. We recall that development and security are closely interlinked, mutually reinforcing and key to attaining sustainable peace. We reiterate our view that the establishment of sustainable peace requires a comprehensive, concerted and determined approach, based on mutual trust, mutual benefit, equity and cooperation, that addresses the causes of conflicts, including their political, economic and social dimensions. We condemn unilateral military interventions, economic sanctions and arbitrary use of unilateral coercive measures in violation of international law and universally recognized norms of international relations. We emphasize that no country should enhance its security at the expense of the security of others. 39. We reaffirm our commitment to the United Nations as the universal multilateral organization entrusted with the mandate for maintaining international peace and security, advance global development and to promote and protect human rights. 40. We recall the 2005 World Summit Outcome document and reaffirm the need for a comprehensive reform of the UN, including its Security Council, with a view to making it more representative, effective and efficient, and to increase the representation of the developing countries so that it can adequately respond to global challenges. China and Russia reiterate the importance they attach to the status and role of Brazil, India and South Africa in international affairs and support their aspiration to play a greater role in the UN. 41. We reiterate that the only lasting solution to the crisis in Syria is through an inclusive “Syrian-led, Syrian-owned” political process which safeguards the sovereignty, independence and territorial integrity of Syria, in pursuance of the United Nations Security Council Resolution 2254(2015), and promotes the legitimate aspirations of the Syrian people. We strongly support the Geneva Peace Talks and the Astana process, and welcome the creation of the de-escalation areas in Syria, which contributed to decrease the levels of violence and generate positive momentum and conditions for meaningful progress in the peace talks under the auspices of the UN. We oppose the use of chemical weapons by anyone, for any purpose and under any circumstance. 42. We reiterate the urgent need for a just, lasting and comprehensive solution of the Israeli-Palestinian conflict in order to achieve peace and stability in the Middle East on the basis of relevant United Nations resolutions, the Madrid Principles, the Arab Peace Initiative and previous agreements between the parties through negotiations with a view to creating an independent, viable, territorially contiguous Palestinian State living side by side in peace and security with Israel. Committed to making greater contribution to such solution, we express readiness to enhance our contribution towards a just and lasting resolution of the Middle East conflict and support international efforts to promote peace and stability in the region. 43. We congratulate the people and Government of Iraq for the recovery of Mosul and for the progress achieved in the fight against terrorism and reaffirm our commitment to Iraq’s sovereignty, territorial integrity and political independence and our support for Iraqi government and its people. We express our concern over the situation in Yemen and urge all parties to cease hostilities and to resume negotiations supported by the United Nations. We also call on all parties directly involved in the current diplomatic crisis in the Gulf region to overcome their dissensions through dialogue and welcome the efforts of Kuwaiti mediation in this regard. 44. We strongly deplore the nuclear test conducted by the DPRK. We express deep concern over the ongoing tension and prolonged nuclear issue on the Korean Peninsula, and emphasize that it should only be settled through peaceful means and direct dialogue of all the parties concerned. 45. We firmly support the Joint Comprehensive Plan of Action (JCPOA) on the Iranian nuclear issue and call upon all relevant parties to comply fully with their obligations and ensure full and effective implementation of the JCPOA to promote international and regional peace and stability. 46. We commend the efforts of African countries, the African Union and sub-regional organizations in addressing regional issues and maintaining regional peace and security, and emphasize the importance of collaboration between the United Nations and the African Union in accordance with the Charter of the United Nations. We support efforts towards comprehensively resolving the issues in Democratic Republic of Congo, Libya, South Sudan, Somalia, Central Africa Republic and Western Sahara. 47. We strongly condemn terrorist attacks resulting in death to innocent Afghan nationals. There is a need for immediate cessation of violence. We reaffirm our support to the people of Afghanistan in their efforts to achieve “Afghan-led and Afghan-owned” peace and national reconciliation, to the ongoing international efforts, including the Moscow Format of consultations on Afghanistan and “Heart of Asia-Istanbul Process”, as well as multimodal connectivity projects to promote peace and stability, to the fight against terrorism and drug-threat, and to the national reconstruction efforts by Afghanistan. We support the efforts of the Afghan National Defense and Security Forces in fighting terrorist organizations. 48. We, in this regard, express concern on the security situation in the region and violence caused by the Taliban, ISIL/DAISH, Al-Qaida and its affiliates including Eastern Turkistan Islamic Movement, Islamic Movement of Uzbekistan, the Haqqani network, Lashkar-e-Taiba, Jaish-e-Mohammad, TTP and Hizb ut-Tahrir. 49. We deplore all terrorist attacks worldwide, including attacks in BRICS countries, and condemn terrorism in all its forms and manifestations wherever committed and by whomsoever and stress that there can be no justification whatsoever for any act of terrorism. We reaffirm that those responsible for committing, organizing, or supporting terrorist acts must be held accountable. Recalling the primary leading role and responsibility of states in preventing and countering terrorism, we stress the necessity to develop international cooperation, in accordance with the principles of international law, including that of sovereign equality of states and non-interference in their internal affairs. We reaffirm solidarity and resolve in the fight against terrorism, value the 2nd BRICS Counter-Terrorism Working Group Meeting held in Beijing on 18 May 2017, and agree to strengthen our cooperation. 50. We call upon all nations to adopt a comprehensive approach in combating terrorism, which should include countering radicalization, recruitment, movement of terrorists including Foreign Terrorist Fighters, blocking sources of financing terrorism including, for instance, through organized crime by means of money-laundering, supply of weapons, drug trafficking and other criminal activities, dismantling terrorist bases, and countering misuse of the Internet including social media by terrorist entities through misuse of the latest Information and Communication Technologies (ICTs). We are committed to prevent and counter the growing spread of terrorist narratives, and to tackle all sources, techniques and channels of terrorist financing. We call for swift and effective implementation of relevant UNSC Resolutions and the FATF International Standards worldwide. We seek to intensify our cooperation in FATF and FATF-style regional bodies (FSRBs). We recall the responsibility of all States to prevent financing of terrorist networks and terrorist actions from their territories. 51. We call upon the international community to establish a genuinely broad international counter-terrorism coalition and support the UN’s central coordinating role in this regard. We stress that the fight against terrorism must be conducted in accordance with international law, including the Charter of the United Nations, international refugee and humanitarian law, human rights and fundamental freedoms. We reaffirm our commitment on increasing the effectiveness of the UN counter-terrorism framework, including in the areas of cooperation and coordination among the relevant UN entities, designation of terrorists and terrorist groups and technical assistance to Members States. We call for expeditious finalization and adoption of the Comprehensive Convention on International Terrorism (CCIT) by the United Nations General Assembly. 52. We recognize the important contribution of BRICS countries to United Nations peacekeeping operations, and the importance of United Nations peacekeeping operations to international peace and security. We emphasize the need for BRICS countries to further enhance communication on peacekeeping matters. 53. We reiterate our commitment to address the world drug problem based on the United Nations drug control conventions, through an integrated, comprehensive and balanced approach to drug supply and demand reduction strategies. We stress the importance of the outcome document of the 30th Special Session of the United Nations General Assembly on the world drug problem, and call for strengthening of international and regional cooperation and coordination to counter the global threat caused by the illicit production and trafficking of drugs, especially opiates. We note with deep concern the increasing links in some regions of the world between drug trafficking, money laundering and organized crime and terrorism. 54. We reiterate the need for all countries to cooperate in promoting and protecting human rights and fundamental freedoms under the principles of equality and mutual respect. We agree to continue to treat all human rights, including the right to development, in a fair and equal manner, on the same footing and with the same emphasis. We will strengthen cooperation on issues of common interests both within BRICS and in multilateral fora including the United Nations Human Rights Council, taking into account the necessity to promote, protect and fulfill human rights in a non-selective, non-politicized and constructive manner, and without double standards. 55. Keenly aware of the global security challenges faced by the international community in the area of international migration, we emphasize the growing role of effective migration regulation for the benefit of international security and development of the society. 56. We consider the UN has a central role in developing universally accepted norms of responsible state behavior in the use of ICTs to ensure a peaceful, secure, open, cooperative, stable, orderly, accessible and equitable ICT environment. We emphasize the paramount importance of the principles of international law enshrined in the Charter of the United Nations, particularly the state sovereignty, the political independence, territorial integrity and sovereign equality of states, non-interference in internal affairs of other states and respect for human rights and fundamental freedoms. We emphasize the need to enhance international cooperation against terrorist and criminal misuse of ICTs, reaffirm the general approach laid in the eThekwini, Fortaleza, Ufa and Goa declarations in this regard, and recognize the need for a universal regulatory binding instrument on combatting the criminal use of ICTs under the UN auspices as stated in the Ufa Declaration. We note with satisfaction the progress achieved by the Working Group of Experts of the BRICS States on Security in the use of ICTs. We decide to promote cooperation according to the BRICS Roadmap of Practical Cooperation on Ensuring Security in the Use of ICTs or any other mutually agreed mechanism and acknowledge the initiative of the Russian Federation on a BRICS intergovernmental agreement on cooperation in ensuring security in the use of ICTs. 57. We believe that all states should participate on an equal footing in the evolution and functioning of the Internet and its governance, bearing in mind the need to involve relevant stakeholders in their respective roles and responsibilities. The structures that manage and regulate the critical Internet resources need to be made more representative and inclusive. We note with satisfaction the progress made by the BRICS Working Group on ICT Cooperation. We recognize the necessity to strengthen our cooperation in this area. To that end, BRICS will continue to work together through the existing mechanism to contribute to the secure, open, peaceful and cooperative use of ICTs on the basis of equal participation of the international community in its management. 58. We reiterate that outer space shall be free for peaceful exploration and used by all States on the basis of equality in accordance with international law. Reaffirming that outer space shall remain free from any kind of weapons or any use of force, we stress that negotiations for the conclusion of an international agreement or agreements to prevent an arms race in outer space are a priority task of the United Nations Conference on Disarmament, and support the efforts to start substantive work, inter alia, based on the updated draft treaty on the prevention of the placement of weapons in outer space and of the threat or use of force against outer space objects submitted by China and the Russian Federation. We also note an international initiative for a political obligation on the no first placement of weapons in outer space. 59. Priority should be accorded to ensuring the long-term sustainability of outer space activities, as well as ways and means of preserving outer space for future generations. We note that this is an important objective on the current agenda of the UN Committee on the Peaceful Uses of Outer Space (UNCOPUOS). In this respect, we welcome the decision by the UNCOPUOS Scientific and Technical Sub-Committee Working Group on Long-term Sustainability of Outer Space Activities to conclude negotiations and achieve consensus on the full set of guidelines for the long term sustainability of outer space activities by 2018 to coincide with the commemoration of the 50th Anniversary of the first United Nations Conference on the Exploration and Peaceful Uses of Outer Space (UNISPACE + 50). 60. We emphasize the importance of people-to-people exchanges to promoting development and enhancing mutual understanding, friendship and cooperation among BRICS peoples. We agree to deepen cooperation in such fields as culture, education, science and technology, sports and health as well as among media organizations and local governments, to strengthen the third pillar of BRICS cooperation and foster a meaningful resonance of the BRICS partnership amongst its peoples. 61. We value cultural diversity as a precious asset of BRICS cooperation. We stress the role of culture and cultural diversity in promoting sustainable development, and encourage BRICS countries to engage in cultural exchanges and mutual learning to cultivate common values on the basis of diversity and sharing. We welcome the formulation of a BRICS action plan to advance practical cultural cooperation and the establishment of the BRICS Alliance of Libraries, Alliance of Museums, Alliance of Art Museums and National Galleries as well as Alliance of Theaters for Children and Young People. We look forward to the success of the BRICS Culture Festival to be held later in mid-September 2017 in Xiamen. We will continue our work on the establishment of a BRICS Cultural Council to provide the necessary platform to enhance cultural cooperation among BRICS countries. 62. We stress the importance of education to promoting sustainable economic and social development, and to strengthening BRICS partnership, and commend the positive progress in our education cooperation. We reiterate our support for BRICS University League and BRICS Network University in conducting education and research cooperation, welcome efforts to promote cooperation among educational think tanks, and exchanges among youth including by organizing youth summer camps and offering more scholarship opportunities to BRICS students. We agree to share experience and practices in realizing education-related sustainable development goals. 63. We believe in the importance of sports cooperation to popularizing traditional sports and deepening the friendship among BRICS peoples. Recalling the successful hosting of BRICS U-17 Football Tournament in Goa in 2016, we commend the success of the First BRICS Games, which was a highlight of this year’s people-to-people exchanges. We encourage relevant departments to sign an MOU on sports cooperation to provide greater impetus to sports cooperation among our five countries. 64. We agree to enhance BRICS role in global health governance, especially in the context of the World Health Organization and UN agencies, and foster the development and improve the availability of innovative medical products through promotion of research and development and access to affordable, quality, effective and safe drugs, vaccines, diagnostics and other medical products and technologies as well as to medical services through enhanced health systems and health financing. We agree to improve surveillance capacity and medical services to combat infectious diseases, including Ebola, HIV/AIDS, Tuberculosis and Malaria, as well as non-communicable diseases and encourage greater application of ICTs to improve the level of health service provision. We welcome the outcomes of the BRICS Health Ministers Meeting and High-level Meeting on Traditional Medicine, and commend the establishment of a long-term mechanism for traditional medicine exchanges and cooperation, to promote mutual learning of traditional medicines and pass them down to future generations. We welcome the decision to set up the Tuberculosis Research Network, to be presented at the First WHO Global Ministerial Conference Ending Tuberculosis in the Sustainable Development Era: A Multisectoral Response, Moscow, Russian Federation, 16-17 November 2017. We express support for the meeting as well as the First United Nations General Assembly High-Level Meeting on Tuberculosis in 2018. We commit ourselves to enhanced cooperation at international fora on health matters including at G20. 65. We reaffirm our commitment to promote a long-term and balanced demographic development and continue cooperation on population related matters in accordance with the Agenda for BRICS Cooperation on Population Matters for 2015-2020. 66. We note with satisfaction the progress in the exchanges and cooperation in various areas, including governance, film-making, media, think-tank, youth, parliament, local governments and trade union, and agree to further advance such exchanges and cooperation. We commend the first joint film production by BRICS countries and commend the success of the BRICS Film Festival, the Media Forum, Friendship Cities and Local Governments Cooperation Forum, Youth Forum, Young Diplomats Forum and Young Scientists Forum. We appreciate the successful hosting of the BRICS Forum of Political Parties, Think-Tanks and Civil Society Organizations as well as the Seminar on Governance, and will carry these good initiatives forward in the future. In this regard, we note the proposal to establish by China the BRICS Research and Exchange Fund. 67. We appreciate the important progress in BRICS institutional development and reiterate our commitment to further strengthen it to make BRICS cooperation more responsive to the changing situation. We commend China for taking measures during its Chairmanship to enhance the Sherpas’ coordination role in BRICS cooperation. We instruct the Sherpas to continue their discussion concerning BRICS institutional development. 68. We recommit our strong support for multilateralism and the central role of the UN in international affairs. We commit to strengthening the coordination and cooperation among BRICS in the areas of mutual and common interests within the UN and other multilateral institutions, including through regular meetings among our permanent representatives in New York, Geneva and Vienna, and further enhance the voice of BRICS in international fora. 69. In continuation of BRICS tradition of outreach since the Durban Summit, we will hold a Dialogue of Emerging Market and Developing Countries on the implementation of the 2030 Agenda for Sustainable Development and the building of broad partnerships for development under the theme of “Strengthening Mutually-Beneficial Cooperation for Common Development” in promotion of BRICS Plus cooperation. 70. South Africa, Brazil, Russia and India commend China’s Chairmanship in 2017 and express sincere gratitude to the Government and people of China for hosting the Ninth BRICS Summit in Xiamen. 71. China, Brazil, Russia and India extend full support for South Africa in hosting the Tenth BRICS Summit in 2018. The following outcome documents have been adopted. We take note of the following meetings and events held under China’s BRICS Chairmanship before the Xiamen Summit.